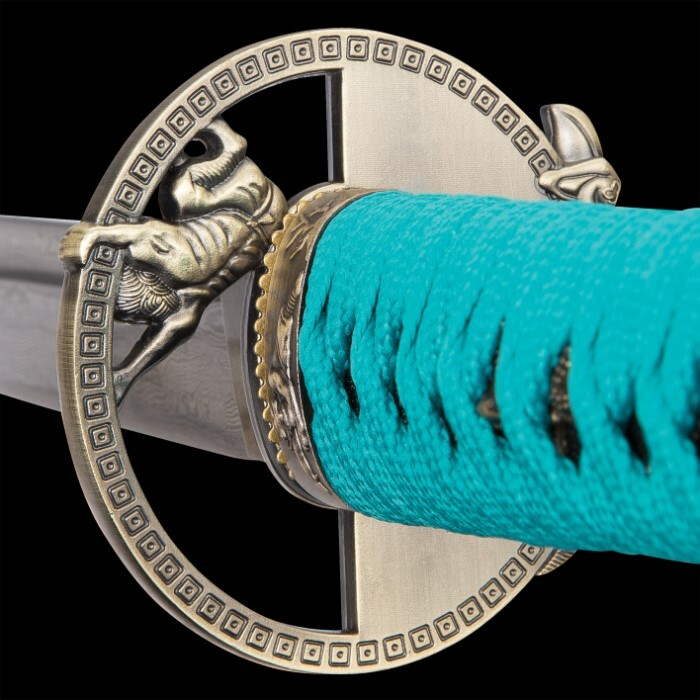 Shinwa is committed to bringing you top-quality, hand-forged swords that will surpass your expectations every time. 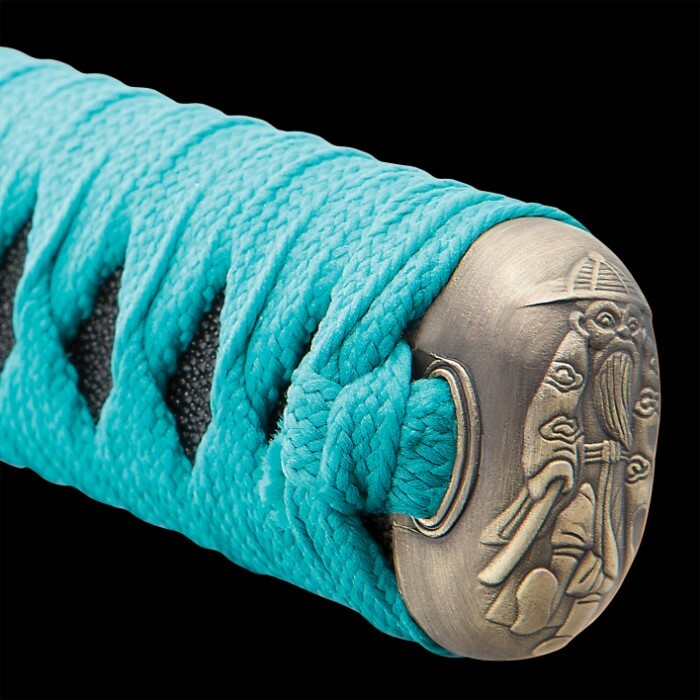 This latest katana sword tells that same story, featuring a 26-1/2" blade that has been forged at temperatures of more than 1000 degrees and hand sharpened by master sword smiths. Authentic details like the heavy blood groove and cast zinc alloy tsuba and menuki dress it up. 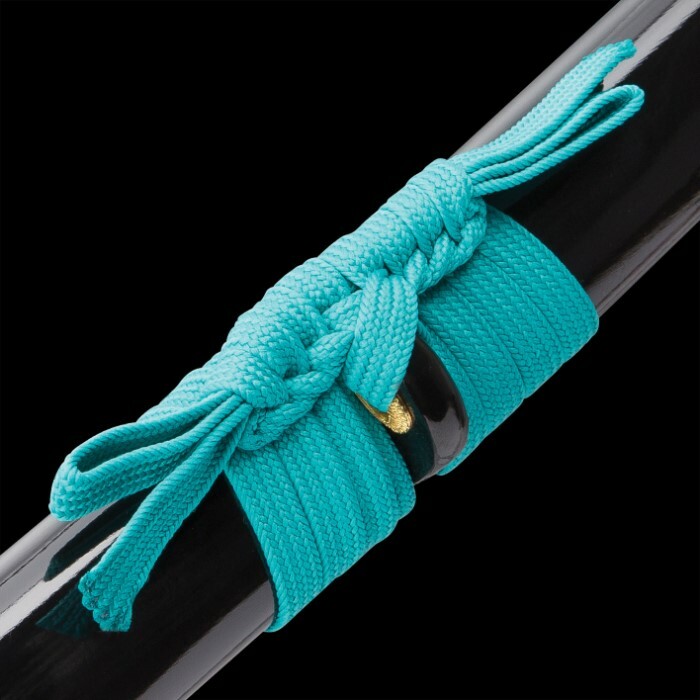 The ray skin handle is encased in teal cord wrappings, and the hardwood scabbard is decorated to match. Measures 39" overall with powerful full-tang construction. The moment I saw this sword I knew I had to get it. 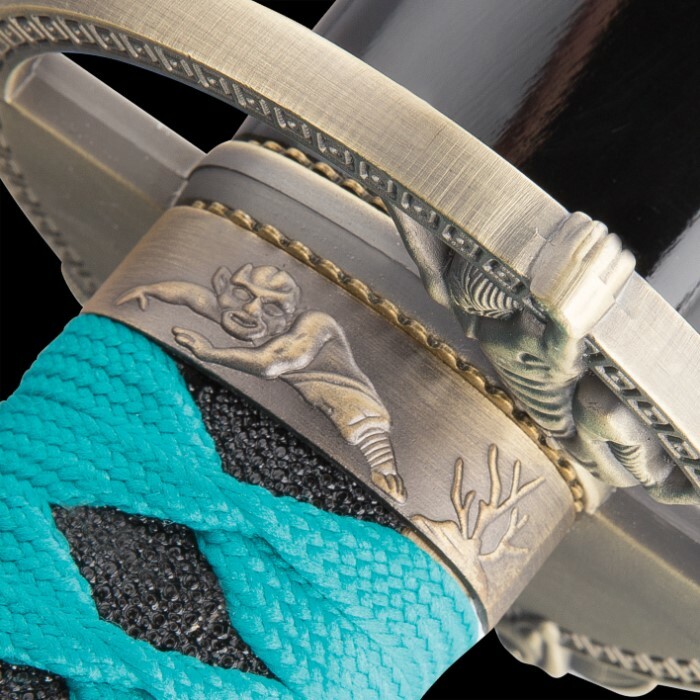 The teal ito, the damascus steel blade, and the tsuba are beautiful works of art. The gift box was nice, and in excellent condition. I only have 2 minor complaints. 1. The blade rattles in the saya, much like my 1060 carbon steel Musashi katana. It's nothing to worry about. 2. 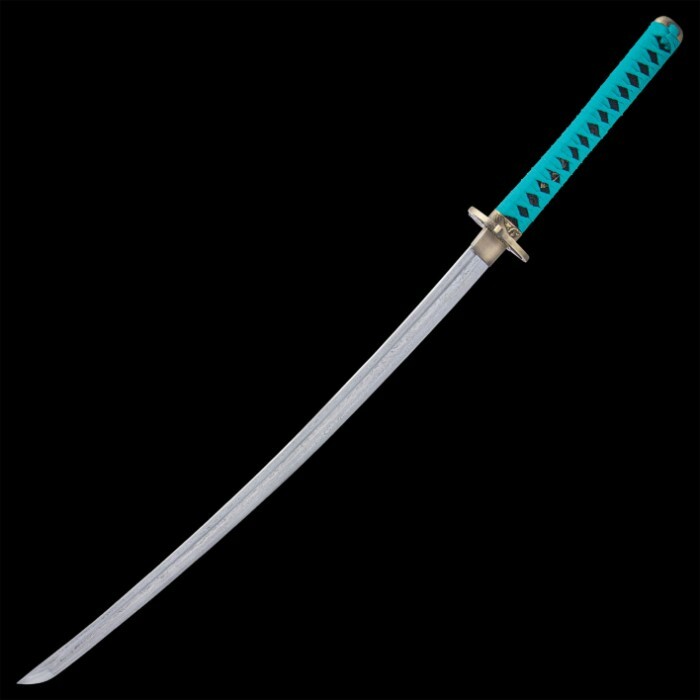 The habaki is loose, and slighly rattles, just like the T10 Shijian katana I bought on Amazon, for $170. Honestly, I expected no less, seeing as how the sword was selling for $70. Other than that, I absolutely love the sword! It has taken the #1 spot in my collection as my favorite katana! 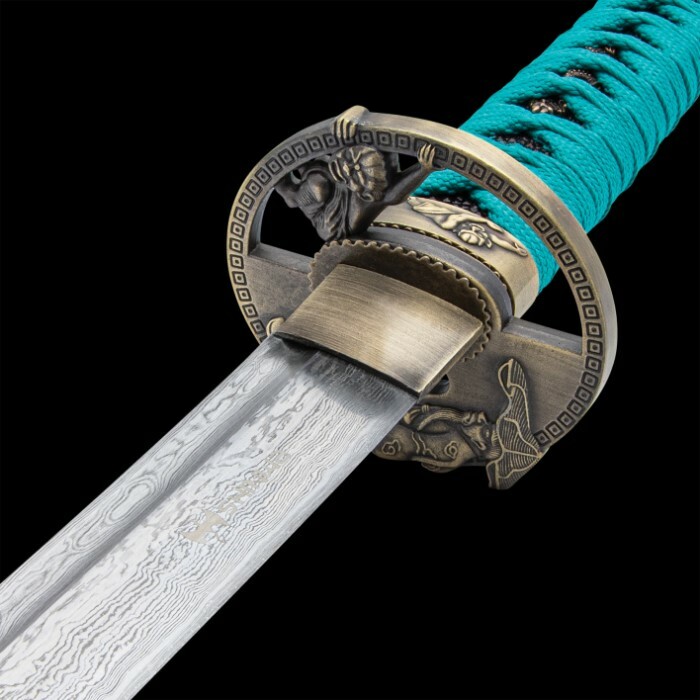 Beautiful, sharp sword! Gift box is flimsy and was broke from the gaurd tho. I was a bit skeptical about this sword at first because it was so cheap, but to my surprise this sword is very high quality. The blade came razor sharp and oiled. Comes in a nice box. When I first drew the sword I could feel how solid it was, nothing like the 40-50 dollar swords I’ve collected up til now. This sword is worth every penny spent. An excellent addition to my collection. This sword raises my expectations of future swords I will purchase. I would much rather have a sword of this quality than some of the ones I already own. If you’re considering this sword, it is without a doubt a great purchase. I love everything about this Katana. Sharp, Beautiful Damascus, No loose fittings, It has a blood groove and a curved blade which is great. I love the color. Definitely get it if you can get a good deal on this. 5 stars! What an exelent work of art ! I'd highly recommend this sword for new collectors. I love this sword. This is my first katana, and boy am I impressed. The box it came in is very beautiful. 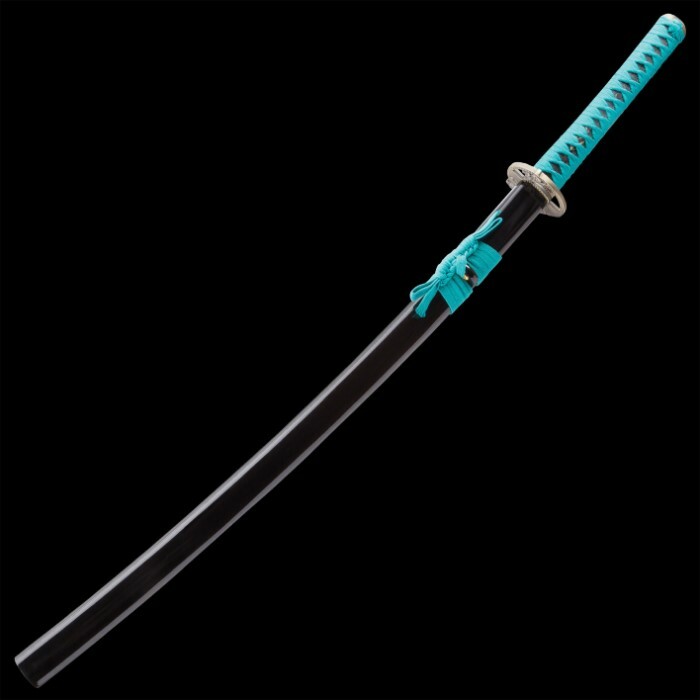 I just wish it was the same color than the katana. This is my first Damascus steel to boot. You really hit it out of the ballpark this time, budk. Thank you. This is a well made beautiful sword, glad I added it to my collection! Have not tested the full tang effectiveness, but I have tasted other shinwa full tang swords and they delivered great cutting abilities. Very happy with this product! Worth every penny at $69.98. The edge will need some work to bring to truly sharp if that is what you're after but the real hard work was already done by someone who knew what they were doing. Very nicely made for twice what I paid. Shipped triple boxed as noted below with the inside being a nice wooden presentation box as Chinese manufacturers are known to do. My only complaint is that the presentation box is broken directly under where the tsuba sits. Could have happened anywhere along the way and there was no damage to the outer shipping box. Customer service happily offered to swap my sword/box for a new one or I could return it for a full refund but I'm very happy with everything else and did not want to bother with all that. Best return/satisfaction policy on the interwebs people. 60 days and you can say "Pffft I changed my mind". No chance I'm sending her back. I've owned many very nice knives in my lifetime but this is my first sword. I've wanted one for as long as I could read epic tales and have handled a few dozen from some real deal brought back after WWII to "holy cow this thing is cheap, and they want HOW MUCH?!?" 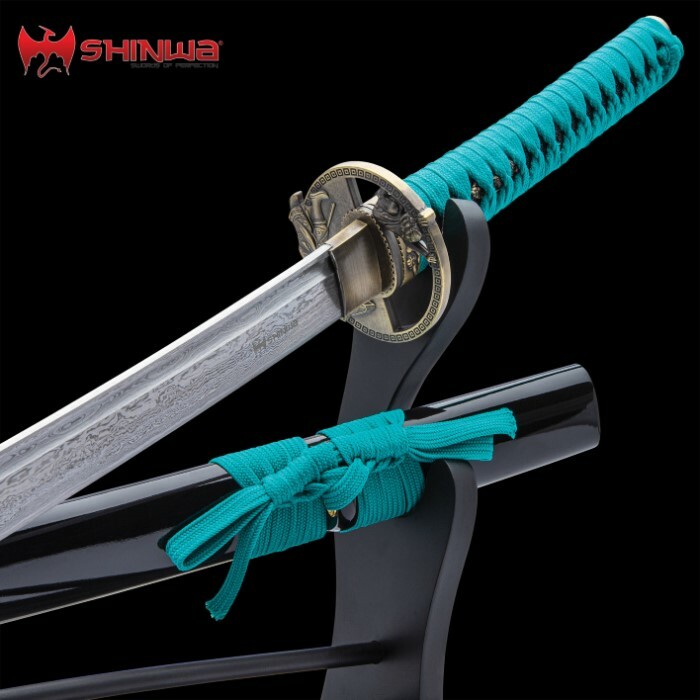 The Shinwa Regal Teal is one of the best value swords I have handled in the under $200 price range. She may be my first, but she will NOT be my last! 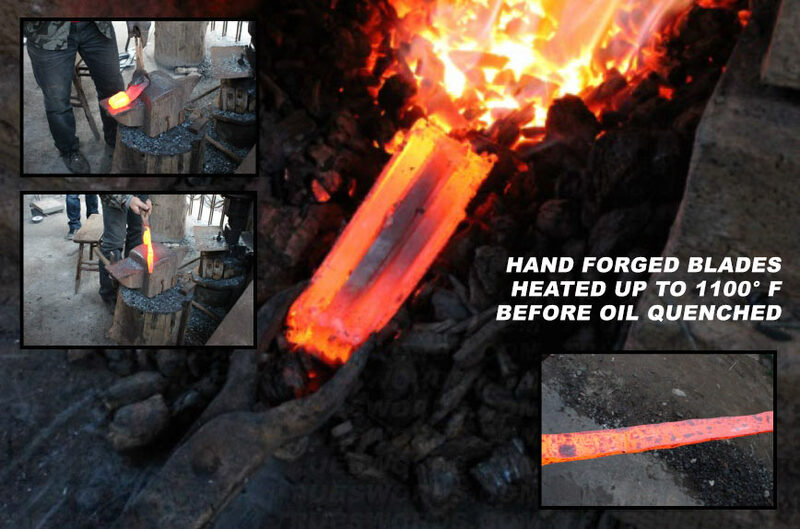 :) BTW this is how true Damascus blades were made. True Damascus was folded and that is where the pattern came from. This blade is crafted the same way. This blade has the true Damascus water patterns. The difference is nobody has been able to reproduce the composition of the steel used in true ancient Damascus blades. Those secrets have been lost to time. Few have even come close.